I didn’t forget about Banned Book week but because I’ve been a bit behind on blogging I wasn’t necessarily going to do a post on it but how can I not mention it after I saw this great creation on my recent library visit? 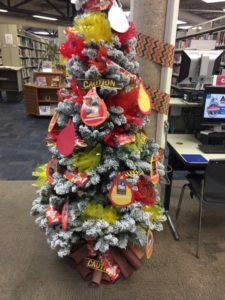 A burning tree of banned books! I had to stop and take a picture and glad that when I did so, I noticed that other patrons stopped to look at the tree as well. Here’s the list of the Banned & Challenged Books of 2017. Anyway, I had stayed away from the library for a couple of months but I was look for some additional books to supplement my choices for the R.I.P. challenge and found these other titles which I think will be great. I’m Thinking of Ending Things by Iain Reid. A man and his girlfriend are on their way to a secluded farm. This sounds creepy doesn’t it? And, probably nothing good will come of this beginning. The Doll-Master and Other Tales of Terror by Joyce Carol Oates. This is a collection of short stories which also includes a chilling biblio-mystery. This sounds good doesn’t it? The Chalk Pit by Elly Griffiths. I’m a huge fan of this series and honestly, this is the book I want to start with now but I need to focus on the book for book group before I start with this one. Well, maybe…. we’ll see what I do this weekend. Hex by Thomas Olde Heuvelt. This promises to be a good scary tale. A picturesque town is haunted by the Black Rock Witch who walks the streets at night . Oh my gosh, I think I need the lights on for this one. What do you think? Have you read any of these? I love the concept of the burning tree of banned books. It certainly catches a patron’s eyes, well at least to me, that is. I’ve not read any of the books mentioned except The Chalk Pit, which I think was a great read, despite I’ve not read the others of this series. Hope you enjoy them all and looking forward to your reviews, Iliana. What a great idea for a library display!! Melody – It’s so cool isn’t it? I love the Ruth Galloway mysteries so I’m really excited to start this one! Joann@Lakeside Musing – It’s so cool right? Jenclair – I wish I could start all of these right now but I’ve got to start my book for book group first! That tree is crazy cool! Also, yes, I adore Elly Griffiths and her Ruth Galloway series. I haven’t read any of your books, but they sound good. I really need to give Griffith a try.